Static in Verona is the work of Chicago musician Rob Merz, which brings electronic and experimental elements into a predominantly indie pop sound, highlighted by sparkling harmonies and catchy melodies. In the two years since the release of Static in Verona's critically-acclaimed 3rd album Odd Anthem, Merz recorded music for over 20 songs and hand-picked eleven to flesh out and create Static in Verona's fourth album Secrets Like Shadows. Symphonies of guitars, thunderous drums and echoing vocals fill the air from the first few moments and only heighten throughout the album. "Now with technology as advanced as it is, anyone can have any instrument imaginable on a song ... and I think on my last two albums I basically did." Merz jokes when describing the new album. "I really wanted to bring it back to how it was when I started recording and build songs around the guitar again." 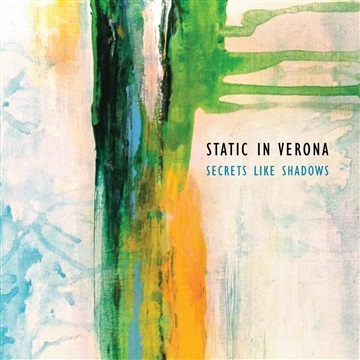 Songs such as Madeline, Sleeping In (Dreams) and Last Night feature the layered guitar hooks that fans have come to love over the almost decade that Merz has been recording under the name Static in Verona. Guitars weren’t the only thing Merz felt could be the focus of Secrets Like Shadows. "Whether it was my own insecurities or just personal preference of what I listen to, but my vocals have been previously treated as another instrument in the past, blending into the mix a bit. I felt like I wanted the vocals and harmonies to be more at center stage this time around, and let the listener really get into the words." The lyrics, telling stories about growing older, broken relationships, and even today's media and politics, are very personal and draw from many recent experiences. "I feel like the themes are common, and while my songs may not be black-and-white story-driven encounters, the situations and feelings expressed are universal."